March 31, 2009 -- Cerec has had cool command of the digital impressions business for nearly 20 years, but the competition among intraoral scanner companies is beginning to heat up. And it's taking a new direction. Until now, Sirona Dental Systems has promoted the Cerec as a combined intraoral scanner and mill that could expand a dental practice by allowing dentists to do what labs usually do. Now three of the four new intraoral scanner companies are betting that most dentists don't want to go into the milling business but would rather make their impressions digitally and send the data to a lab to produce the restorations. "We believe the relationship between the dentist and the lab is still critical," said Chad Naughton, a spokesperson for 3M ESPE, which started rolling out its Lava chairside oral scanner (COS) last year. That's the same strategy Cadent has taken with its iTero scanner, launched in 2006. And it's how the newest company, IOS Technologies, will position its IOS FastScan, scheduled to debut in February 2010. Sirona hasn't stopped selling mills, nor has D4D Technologies, which launched the E4D combination scanner and mill at the end of 2007. But both companies now offer the ability to send the digital impression to a lab instead of your own milling unit. You can even buy the Cerec scanner by itself if you don't want to do any milling. Both camps claim an advantage. On the one hand, dentists can cut costs on inlays, onlays, crowns, and veneers by doing their own milling. And patients will appreciate getting the restoration placed in a single appointment. On the other hand, buying a scanner alone is cheaper than getting it with a milling unit. Plus, labs are still needed for larger, more complicated work such as bridges, and labs might be more willing to accept digital impressions for the larger work if they're also getting the smaller jobs. They could even be resistant to working with files from Cerec and E4D, seeing the dentist who uses these products as potential competitors. It's too early to tell which approach will prevail, but "there's growing recognition that digital impressions will replace paste-based impressions," said Jeffrey Johnson, a stock analyst with Robert W. Baird. It's faster. Nothing has to dry; you just put the camera wand in the patient's mouth and take a picture (though for some systems you have to apply a reflective coating to the teeth in question), then display a 3D model on the computer screen to show what kind of restoration you want. You then send the data to the lab over the Internet instead of waiting for the mail. It may be more accurate. All the companies point out a high error rate in the traditional impression-making process and argue that their systems can automatically catch and eliminate some of these mistakes. Still, so far most dentists are sticking to paste. Only about 8% of U.S. dentists are making digital impressions, and the vast majority are using a Cerec system, Johnson said. Worldwide, some 24,000 dentists have installed a Cerec, according to Sirona. The other companies aren't disclosing sales figures, but Johnson estimated D4D has sold about 500 E4D systems, while Cadent has placed a few more than 600 of its iTero scanners. The relatively low numbers don't reflect poorly on the technology, Johnson said. Dentists are sometimes slow to adopt new equipment, especially when it has a big price tag. He noted that fewer than 40% of dentists have bought into digital x-ray equipment. In fact, Sirona and Henry Schein (which distributes the E4D) both noted sales of their CAD/CAM systems as bright spots in otherwise difficult recent fiscal quarters. "There is strength in certain aspects of our dental equipment market, particularly [where] we have products related to productivity increases and ... can demonstrate the return on investment clearly," said Henry Schein CEO Stanley Bergman in a February 24 earnings call. "A prime example of this is our E4D CAD/CAM system, which is performing very well. 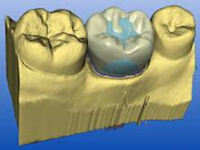 The Cerec software displays a warning if the prescribed minimum wall thickness is not maintained. Image courtesy of Sirona. The new Cerec AC is faster and more accurate than previous models, according to Sirona. It offers image stabilization so you don't have to rest the camera wand on a tooth to get a steady focus. It can now scan full arches. (Previous models made a single image from one perspective.) And it will automatically capture an image when the wand is still, avoiding the need for a foot button. Sirona has also released software allowing users to combine 3D images from its Galileos cone-beam CT system with Cerec images so that implant placements can be planned in conjunction with crowns. In the future, dentists will be able to make their own implant abutments using the Cerec, the company said. iTero uses parallel confocal technology to capture images. Image courtesy of Cadent. Cadent's iTero was the first system designed to send images to labs, so it has more experience with this approach. It's also the only system in which the user doesn't need to apply any reflective coating to the patient's teeth. How is that possible? iTero uses a parallel confocal technique rather than triangulation to create images in three dimensions. In triangulation, three beams of light are projected from different angles. By capturing their reflection, the computer locates the object in three dimensions. But if different surfaces reflect light differently -- as in the case of dentin versus enamel versus amalgam or resin -- the algorithms don't work. Reflective coatings provide a uniform surface. The iTero system works by projecting 100,000 laser beams on the preparation. The reflected beams pass through a lens that focuses on a pinhole. Only those beams that travel a given distance will be focused into the pinhole. The camera measures the distance to each point on the surface it is capturing by noting whether the reflected beam is focused into the pinhole. Using this system, the iTero can make accurate images without reflective coatings. Launched by D4D at the end of 2007, the E4D directly challenged Cerec by offering dentists the opportunity to mill impressions in their own offices. Some distinctions between the two systems have faded since then, since both now use laser and take multiple images that are stitched together by the software. D4D spokesman Mark Ebersold still argues that dentists need to spray reflective coating much less often with the E4D, but John Sweeney, director of investor relations for Sirona, says the latest Cerec model makes that process easier than with the previous ones. Like Sirona, D4D has also added image stabilization software that captures images automatically. One of the biggest distinguishing features for the E4D may be the three years of technical support included in the purchase price, adding to a slight price advantage over the most expensive Cerec model. 3M ESPE has been rolling out its Lava COS region by region in the United States and will soon be available nationwide, Naughton said. The Pacific Northwest and Southern California come next, Naughton said. Like the iTero, the Lava COS doesn't come with a milling unit, so you can only use it in conjunction with a lab. As the system's signature feature, Naughton points to the capture mechanism, which uses video rather than still images to create its virtual impressions. In this way, the machine has much more data to work with, he said. It doesn't need image stabilization because it is continuously capturing images as long as the operator is within the correct tolerance, he explained. The newest system is so new that you can't buy it yet. Although the company is still putting the final touches on the IOS FastScan, CEO Martin Dymek said he expects to distinguish the system from its competitors in two key ways. Having trouble viewing this clip? Click here to download the free Adobe Flash player. The IOS FastScan digital impression and modeling system uses a laser line scanner and an algae-based fluorescent liquid. Video courtesy of IOS Technologies. First, he hopes to undercut them on the price of a standalone scanner by about $5,000. Second, he hopes to let you skip a step. Like the Lava and iTero, the FastScan is only a scanner, so you'll have to work with a lab. But all the other CAD/CAM companies require you to send them the data, and they charge you about $25 for each virtual impression you send. They use the virtual impression to create a stereolithic model that then goes to the laboratory. In some cases, the CAD/CAM company sends data to the lab ahead of time, so the lab can get started making the restoration, then check its work against the model when the CAD/CAM company sends it along. IOS FastScan specializes in outputting data in stereolithography (STL) format, a standard that all the laboratory computers can recognize. (Other companies can convert their data to STL but may lose something in the translation.) If you buy FastScan, you will have the option of sending the data to IOS partner Glidewell Laboratories to fabricate a model at a reduced charge (about $10 per click, according to Dymek). But if your favorite laboratory has the ability to 3D print its own stereolithic model -- or the confidence to make a restoration without a model -- you can send the data directly there, saving the fee per click altogether. "Very much our strategy is to encourage the lab to make modelless restorations," Dymek said. Another difference between FastScan and other systems is that the FastScan laser moves automatically on a track within the wand so that you only have to hold the wand in three positions (buccal, lingual, and occlusal) to scan full arch. So which is best? Only years of competition and testing will determine which system -- and which business model -- works best for the largest number of dentists. "It will be five to 10 years before we get a winner," said analyst Johnson. And there is plenty of room for more than one system to succeed, he added.